Demonstrates the Power of Grassroots Actions. Never underestimate the day of humble beginnings. 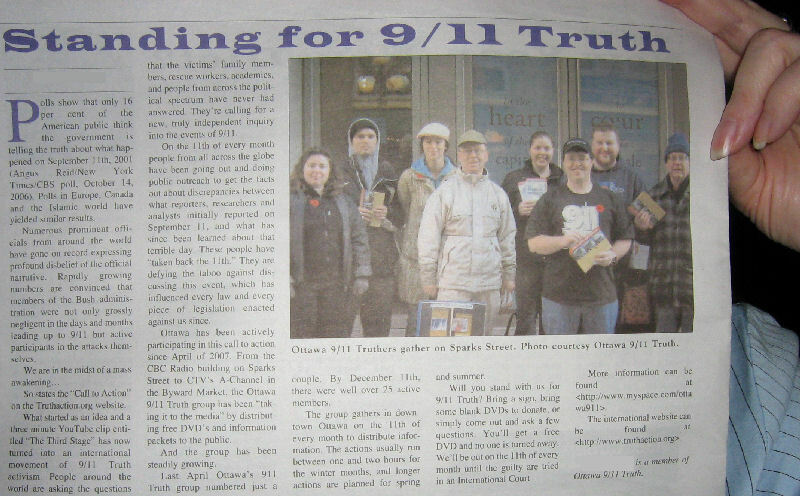 Ottawa 9/11 Truth featured in The PEN, a local Ottawa paper. Ottawa 9/11 Truth is one of an ever growing number of local groups around the world that have come together through the courageous initiative of one or two people going out ALONE on the Eleventh Day of the month and taking action for 9/11 truth. Through their determination and persistence - and willingness to stand alone for the truth - they have slowly but surely attracted others to join them in their action. We are spreading the truth around the world, we are growing and we aren't stopping until justice. February 11 marks the one year anniversary of the campaign for International Days of Truth Action. Isn't it time you joined us? Mark of Ottawa 9/11 Truth asked me to post this here for him. Now Mr. Chretien has something comfy to wear while he watches LCFC!